This figure is probably the most widely distributed of all the string figures. I have seen it done by the African Batwa Pygmies, the Philippine Negritos and Linao Moros, and American Indians of the Chippewa, Osage, Navaho and Apache tribes. Dr. Haddon gives it as an Omaha string trick (5, p. 218) and says it is known to the Japanese. I have been told that it is well known in Ireland. Dr. Haddon also met with it in Torres Straits; in Murray Island it is known as Kebe Mokeis = the Mouse (Rivers and Haddon, p. 152); quite recently it has been reported from the Wajiji in British East Africa, and from the Alaskan Eskimos. First: Hold the left hand with the palm facing the right and the fingers pointing away from you. 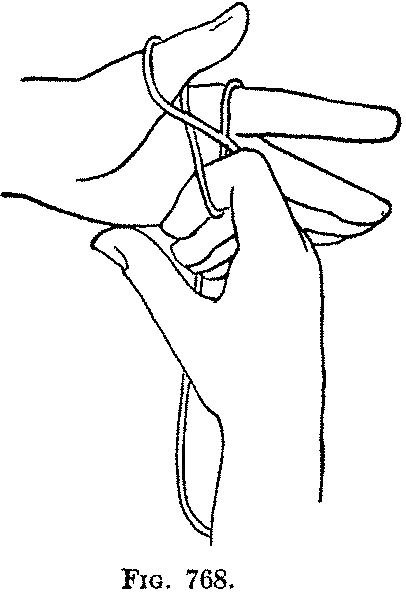 With the right hand place the loop of string over the edge of the left thumb, and let it hang down over the palm and back of the left hand (Fig. 766). 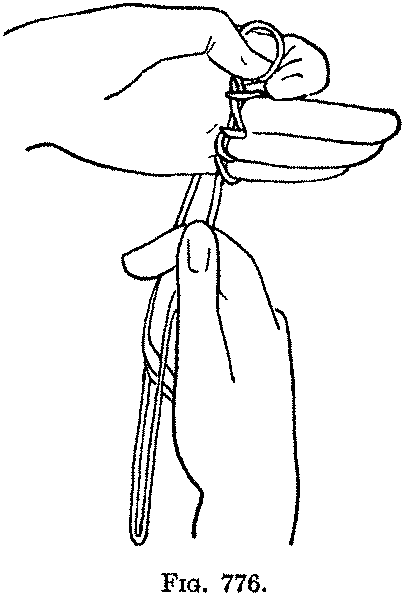 Second: Pass the right index on the near side of the left palmar string, between the left thumb and index, and catch the string on the back of the left hand (Fig. 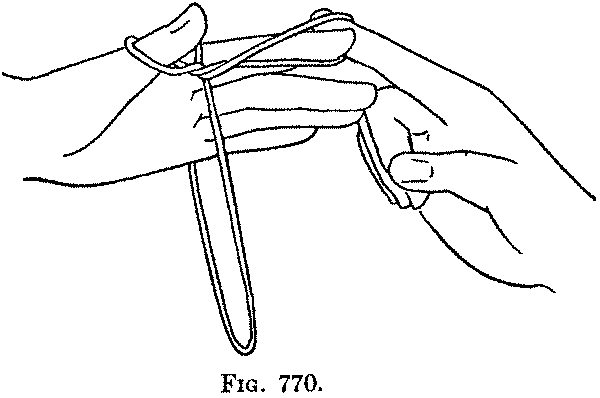 767), and pull it to the right between the left thumb and index and on the near side of the hanging string (Fig. 768). 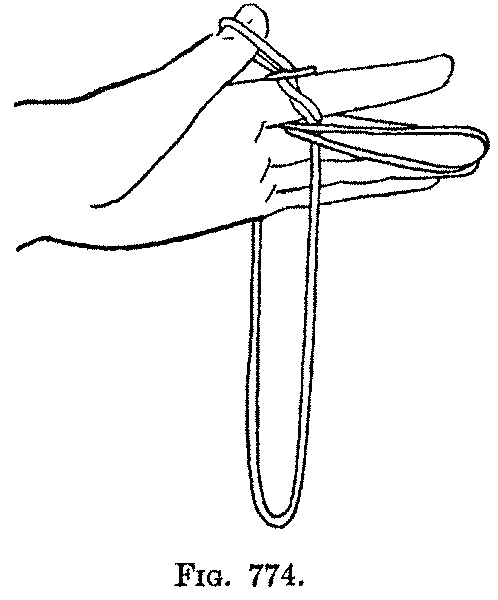 Do not pull the loop entirely out, but with the right index give it one twist away from you (Fig. 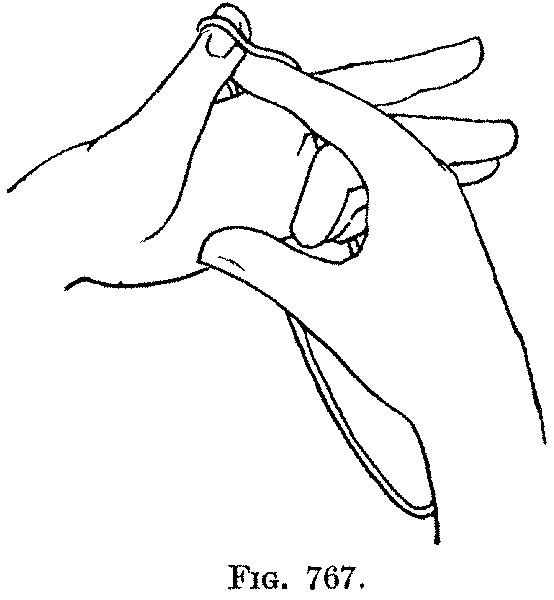 769), and put it on the left index (Fig. 770). 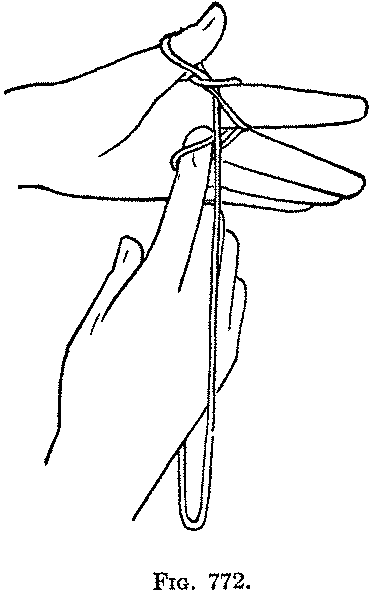 Pull down the two hanging strings, in order to hold tight the loops on the thumb and index. Third: In the same way pass the right index on the near side of the hanging string (Fig. 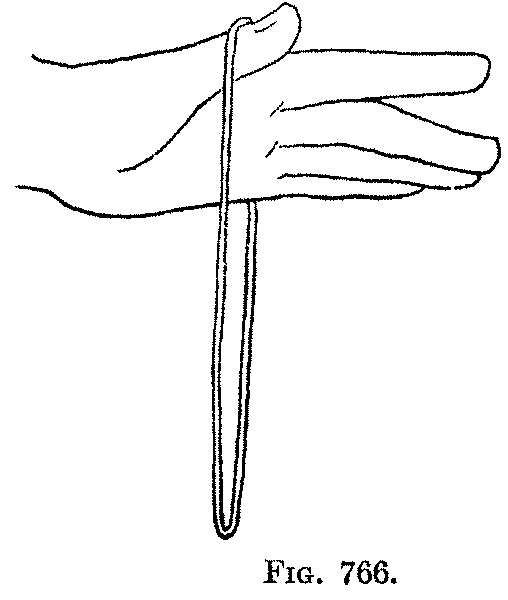 771), between the index and middle finger, catch the string on the back of the hand, and draw it through between the index and middle finger, on the near side of the hanging string (Fig. 772). Give the loop one twist away from you (Fig. 773), put it on the middle finger (Fig. 774), and pull the hanging strings tight. 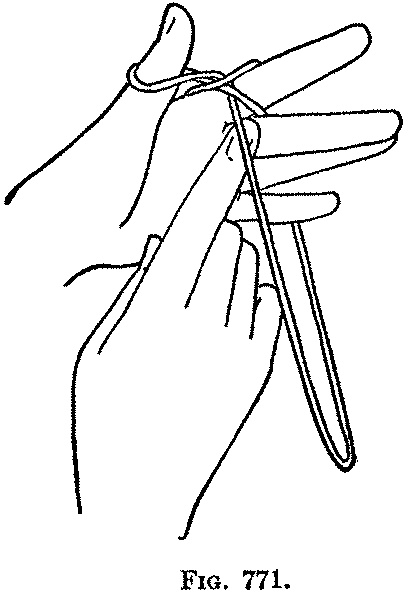 Fourth: In the same way put a loop on the ring finger. 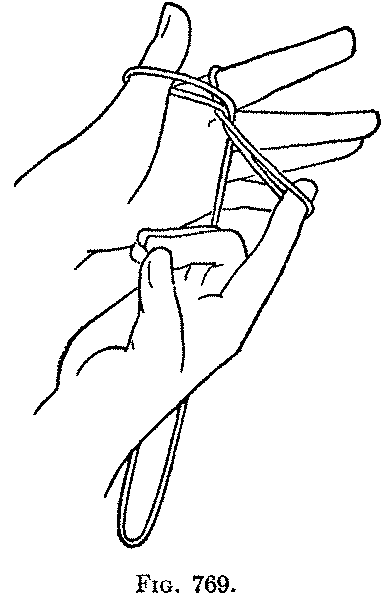 Fifth: In the same way put a loop on the little finger (Fig. 775). 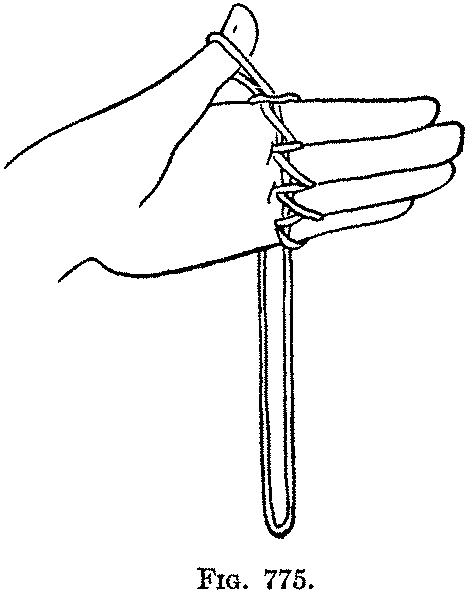 Sixth: With the right thumb and index take the loop off the left thumb, and place it between the tips of the left thumb and index (Fig. 776), which should now hold it lightly. 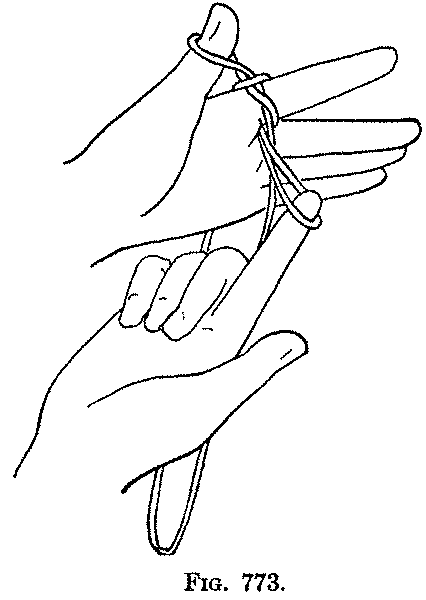 With the right hand pull down the string which hangs from the palmar side of the left hand, letting go the loop held by the left thumb and index, and the entire string will come off the hand; make a squeaking noise as "the mouse (the thumb loop) escapes from the cat."